This post is about The Home and the World, a novel originally published as Ghare Baire in Bengali in 1916. Its author, Rabindranath Tagore, was born in Kolkata, British India. He was a wealthy, well-travelled Bengali writer best known for the poetry collection Gitanjali. In 1913 he was awarded the Nobel Prize in Literature. 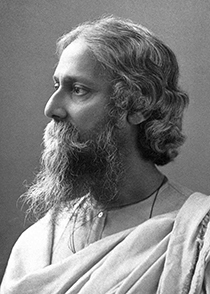 An internationally known literary and artistic man from a wealthy, socially active family owning extensive lands in what is now Bangladesh, Tagore was anti-imperialist yet ultimately rejected the nationalist Swadeshi movement, which promoted production and exclusive consumption of local goods. The Home and the World reflects the author’s mixed feelings on the subject. See below to find out what you need to know to decide whether you should read The Home and the World, or what you should know about it even if you never do! What is the setting of The Home and the World? Most scenes occur within the household of a wealthy Indian landowner in West Bengal in British India. Who are the characters of The Home and the World? Bimala, the central main character, is the beautiful, devoted wife of the local rajah, Nikhil. Her husband has given her a private, modern, Western education as well as many imported gifts. He has also started to encourage her to form and share her own opinions. Nikhil is a wealthy landowner. He loves and idealises Bimala, and wants to help her grow and prosper intellectually. He also loves his country and would like to see it become more economically and legally independent, but believes in relying on market forces and legal process rather than fiery political rhetoric and violent coercion. He is calm, patient, protective, thoughtful, honest, forgiving, conscientious, practical, educated and modern. Sandip is an old friend of Nikhil’s and a charismatic nationalist leader. After Sandip and Bimala catch sight of each other at a rally, Bimala convinces her husband to invite Sandip to dinner, and he not only accepts, he lingers on as a house guest. Bimala learns that he is a firm believer in creative destruction: only out of the ashes can a new world arise. His rallying cry is “Bande Mataram”, meaning “Hail Mother”. He is impatient, impulsive, charming, jealous, idealistic, ambitious, dishonest and cruel. The Bara Rani, Bimala’s sister-in-law, who is keen to mock and criticise Bimala. Chandranath Babu, Nikhil’s former tutor, a highly respected and kind old man. Amulya, a young man whose loyalties are divided between Sandip and Bimala. What are the themes of The Home and the World? What is the best way to pursue nationalism? The Swadeshi movement’s goal, independence, is admirable, but its methods often cause more harm than good, resulting in economic hardship and even deadly violence among Indians. What is the role of women? Allowing women to participate meaningfully in the world is presented as a good modern idea, though not necessarily an easy or risk-free one to enact. What is manliness? Sandip advocates doing and taking whatever seems necessary without asking permission or worrying about consequences, whereas Nikhil prefers seeking change constructively, thoughtfully and humanely. What is real and true and good? At times, truth seems to be that which is felt strongly, or even that which is useful for others to believe. However, strong feelings can threaten that which is reasoned to be correct. What is the central plot or conflict of The Home and the World? The story is a love triangle set in a time of social unrest in which people from all walks of life have started to move against British rule. Sandip, a nationalist, believes that the end justifies the means; he will lie and steal and even kill for an abstract ideal. Since he believes in taking whatever he wants, why would he balk at taking another man’s wife? Nikhil is too timid, or too principled, to approve of unsavoury means, and points out that the nation consists of nothing apart from the individuals who live in it, who are often harmed by the action of idealistic firebrands. He wants Bimala to be happy, perhaps even if it means setting her free to love another. Bimala is caught between them. She sees the good in her loving husband, Nikhil, but is tempted by the power radiating from the uninhibited Sandip, who praises her unashamedly and enshrines her as a concrete representation of his beloved nation. To what extent will Sandip’s rhetoric shape Bimala’s choices—and the fate of the rajah Nikhil and his people? Gutenberg.org offers a free, digitised English translation. A film adaptation directed by Satyajit Ray was released in 1984.